The Bucks Club features varying tee distances, meaning you can challenge yourself with our 6,300- yard blue tees or take it a bit easier with the shorter red tees. As you work your way through The Bucks Club, you’ll find yourself challenged by the undulating greens and strategic bunker layouts, but at no point will you feel overwhelmed. Our course is designed to challenge seasoned golfers while relaxing the novices, all at once. The rolling terrain of the original layout is reminiscent of the design features used in many of the Philadelphia-area classic course routings of the 1920’s. While the original front nine remain, new developments have altered the back nine. These back nine holes reflect a contemporary, target-oriented design. The golf course is walk able, but the elevation changes and the distance between greens and tees on the back nine make for a more challenging trek. 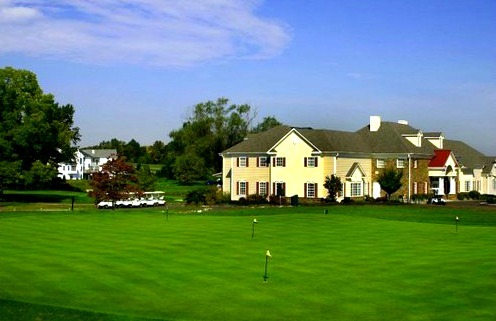 With 18-hole rates starting as low as $35, The Bucks Club provides an unmatched value for championship golf in the Greater Philadelphia area. From Philadelphia or the Southeast via I-95 - North to exit for Route 132 (Street Road) Westbound. Route 132 West about 13 miles to Route 263 (York Road). Right onto Route 263 North. Club is 4 1/2 miles ahead on the left. From Philadelphia or the West via I-76 - Take I-76 (The Schuylkill Expressway) West to the Blue Route (I-476). Take I-476 North toward Plymouth Meeting and the PA Turnpike. Take PA Turnpike East toward New Jersey, 2 exits. Take Route 611 North 4 1/2 miles to Route 132 (Street Road). Turn right onto Route 132 East, go 2 1/2 miles to Route 263 (York Road). Turn left onto Route 263 North. Club is 4 1/2 miles ahead on the left. From Central or Northern Jersey - Take Route 202 South through Flemington and continuing across the Delaware. At Peddlar’s Village, 6 miles beyond the River, Route 263 joins Route 202. Go straight ahead on Route 263. Club is about 7 more miles south on the right, next to the Middle Bucks Technical Institute. From Northeastern PA - Take Route 611 South, using the Doylestown bypass. Turn left (East) onto Almshouse Road, just south of Doylestown at "The Barn Plaza" with the Kohl’s store. Take Almshouse Road for 2 1/2 miles to Route 263, York Road. Turn Left (North) onto Route 263. The club is 1/2 mile ahead on the left.